This is the complete schematic for the development board. Address and Data bus wires are drawn separately (not in a bus), so that it's easy to color over them on a printout, if you choose to manually connect the wires. It really is easier to buy a bare circuit board, though. This design and its schematic have been placed in the public domain. They are distributed in the hope that they will be useful, but are provided without any warranty, not even a warranty of merchantability or fitness for a particular purpose. 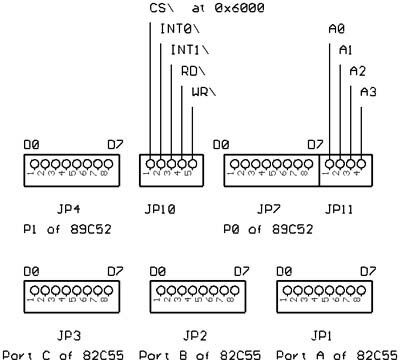 The address bus in this schematic is connected in an unusual way, which is optimized for simpler point-to-point wiring. For anyone building the board using wire-wrap or hand soldered point to point construction, this wiring scheme makes for much less clutter in the wiring if the chips are positioned similarily to the layout on the printed circuit board. Very few wires cross over one another. This also makes the PC board layout a bit simpler, allowing wider traces and fewer vias. All memory on the rev 3 board is read using MOVC (code space). The RD signal is not connected, so MOVX may not be used to read the memory.